I am a Clairvoyant,Claircognizant,Clairsentient psychic and Empath, Angel Medium and High Vibrational Practitioner. It is my life calling to help people-my profession as a nurse, a go to person in my community, as a mother, and as an always eager psychic to everyone who contacts me. We are here on this Planet to learn,perfect and experience together; in an increasingly negative environment , where we all go trough hardships. It is my calling and Life path as a spiritual counselor, and with the help of the Higher Realm,to be a connection between people and the Other Side. 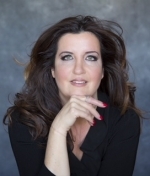 I have been fortunate to be mentored by Anna Simon Psychic Medium and Spiritual Teacher -she is my reference. I work with oncology specialists- one of the services I am providing is a free one time reading for cancer patients in need of spiritual counseling. I wasn't sure what to expect in my reading with Szilvia. She was AMAZING. Without knowing much about me, she was able to pick up on things of things in my life that I really wanted to know about without me having to say much. Szilvia really did want to help & offered much guidance/insight. Such great energy, very compassionate & easy to talk to. I definitely recommend her if you need guidance. Please give her a try. I feel so much better after speaking with her. Thank you so much Szilvia! I just had a reading with Szilvia and all I can say is that she was amazing. She has a great energy about herself. Offers so much help and guidance. She knew so much about me. I would highly recommend her. An angel among us. Szilvia is incredible. She was able to read me without any knowledge of what’s happening in my life. I truly believe she has a gift. She’s very compassionate and helpful and very easy to talk to.